DataTherapy built the market leading hospitality platform Platopus Retail and also are custom software developers who create bespoke in house applications for some of the UK's largest companies. 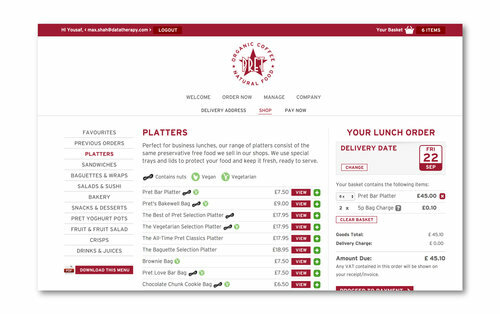 Organise your Food to Go business with Platopus Retail or add a online ordering system to your website with Platopus Delivery, both tools work beautiful together and are used by the leading Food to Go retailers. Our platform provides you with the tools you need to easily manage, market and sell your products. DataTherapy partners with Sandwich and Food to Go Retailers for over 18 year supplying software solutions and e-commerce systems which support brand values and strategic objectives. Organise your Food to Go business with Platopus Retail. Looking to integrate your online ordering system into your website? After 20 years of building solutions our toolkit is refined and powerful enough to deliver the solutions our clients need. We use the FileMaker Platform for customers who need solutions for small workgroups and our own platform Platopus for projects and solutions which will be used by enterprise workgroups or the general public. Both can be designed for access using desktop, web and mobile devices. Our platforms work in harmony and indeed for many solutions we use them both! — Catherine Monaghan, Retail Marketing Manager EAT. For Food To Good operators that want to increase online delivery margins and improve the customer experience use our platform to manage products and locations. It's been proven to work with some of the biggest and smallest operators and the teams love how they only have to make a change once… not in 6 different places and know where to go to find out the information they need fast. Read how Platopus is changing our customer's perception of how to run their business. We build bespoke database solutions using FileMaker, nothing is quite like it for bootstrapping a business or process. The FileMaker platform is ideal for SMEs looking to deploy workgroup scale systems on premises or cloud-based data management system. It is flexible and adaptable enough to meet changing business requirements over long periods and is highly suitable for organisations that want the freedom of a system that can be amended either in-house or in partnership with professional developers. Read how we have used FileMaker to enhance our customer’s business processes and talk to us today about your requirements. Our business is set up to solve your problems: everything about us, from the platforms we develop in and our approach to consulting is geared towards this basic principal. We pride ourselves on our ability to listen, understand and analyse our client's challenges. Our clients know best the problems they are trying to solve, it is our job to come up with the best way to solve them. Sometimes we all need a little expert help.